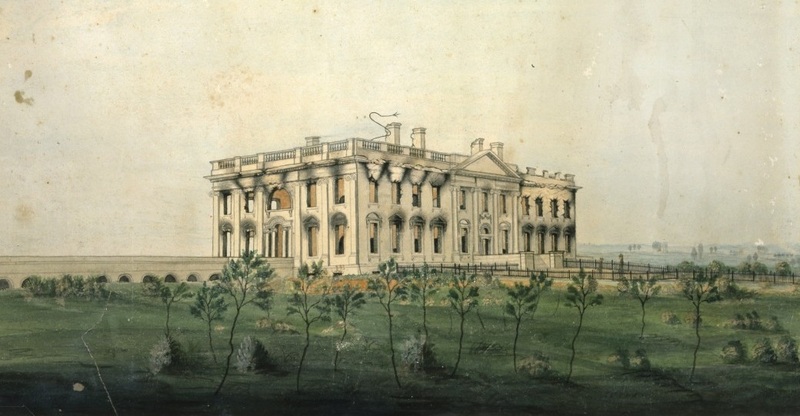 The President’s House [after the burning of Washington], c. 1815–16. Watercolor on paper by American engraver George Munger (1771–1825). A note in Art in the White House: A Nation's Pride (2008) explains the strange S-curved shape on the roof. “It is most readily interpreted as part of a lightning protection system. Not a lightning rod, given its length, but rather part of the metallic conductor that encircled the roof, now torn from its mooring." Image from the White House Historical Association website. For our previous Story of the Week selection, which commemorated the 200th anniversary of the burning of Washington on August 23–24, 1814, we showcased the letter Dolley Madison wrote to her sister just hours before she fled the White House with her staff, important artifacts, and a famous painting of George Washington. This week we present the recollections of that same event by George R. Gleig, an eighteen-year-old British officer who participated in the attack on the nation’s capital. The second half surveys the destruction of federal buildings (including the White House, the Capitol, and the Treasury), which began immediately after a British party bearing “a flag of truce” entered Washington to negotiate terms of surrender and were instead fired upon by riflemen hiding in a private home. One incident is not mentioned in Gleig’s account. When British Admiral George Cockburn arrived in the city, he searched for the offices of the National Intelligencer, which had long been insulting and taunting him, and oversaw personally the destruction of the pressroom. Spectators overheard him denouncing the publisher “with much of the peculiar slang of the Common Sewer.” The Encyclopedia of the War of 1812 mentions a contemporary report claiming that the admiral instructed soldiers to “take special effort to obliterate all of the c’s in the newspaper’s type racks” so that the publisher could no longer spell Cockburn’s name. Notes: The first page of the selection mentions Isis, which is the section of the Thames that flows through Oxford. 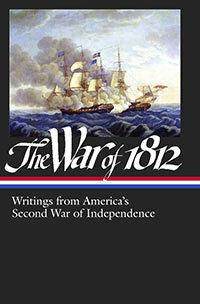 Page 518 refers to the siege during the Peninsular War by Wellington’s army of a large French garrison in the northern Spanish port city of San Sebastián. The siege lasted from July 7, 1813, to the surrender on September 8. During the final week British and Portuguese soldiers ransacked, pillaged, and burned the city, leaving only a few buildings standing. The hour of noon was approaching, when a heavy cloud of dust, apparently not more than two or three miles distant, attracted our attention. . . . If you don't see the full selection below, click here (PDF) or click here (Google Docs) to read it—free!